Michael Moriarty decided stop by the Woodlawn Gift Shop on Katonah Ave. to purchase a $25 Cash Blowout scratch-off ticket after his laundry run on April 12. As he was already a little late to pick up his daughter, he grabbed the first ticket he saw without really bothering to choose properly. 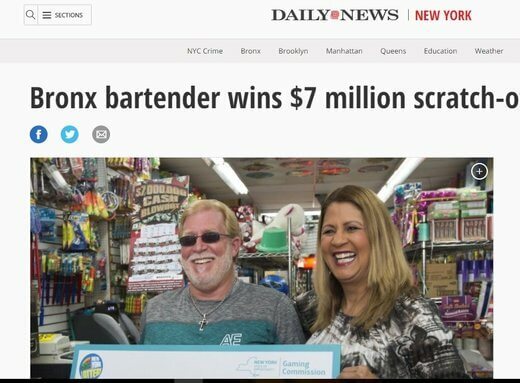 He nearly collapsed right at the store when he discovered he had won the top prize of $7 million. The clerk even came to ask him if he was sick. Now the lucky man says he wishes to buy a fishing rod for himself, take care of his children and grandchildren, and buy a combination bath tub and Jacuzzi for his nieces. Moriarty will not disclose where he lives and where he works. He only says he will stay in the same neighborhood and even plans to continue working because he loves his work. After taxes, his single lump sum payment was still a hefty $4.3 million.